Friday May 29th beginning at 5:00PM at Fox Creek Stables in Wauconda. Bring your horse with their legs wrapped. Don't know how we will show you! This clinic is open to everyone. Come and watch even if you do not want to ride yet. 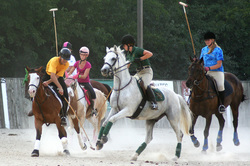 For information about the Barrington Hills Polo Club, please contact John Rosene, 847-854-1415.